After a long silence on this blog, I’d like to share with you the presentation given by Martin yesterday at a local Bahá’í gathering. I’d like to talk about an event that happened at Christmas 1968. It’s almost exactly 50 years ago, so you’d need to be over 60 to have a detailed memory of it. You may be aware that in July next year, we will celebrate 50 years since Man fist stepped onto the moon. But before that, another Apollo mission had to happen, and I would say that this one is at least as significant, if not more so, than the Apollo 11 mission. Why? On Sunday 21 December, 1968, Apollo 8 was launched with astronauts Frank Borman, James Lovell and William Anders on board. All three men are still alive, now in their 80s and 90s. Their mission was to test navigational techniques and a propulsion system that could, for the first time ever, propel a manned space craft beyond earth orbit. The goal was to place the craft in orbit around our moon, and return the capsule and crew safely back to Earth. It had been expected that, with its white clouds and the blue oceans that cover about three-quarters of its surface, Earth would look quite good from beyond its orbit. But when William Anders pointed his camera back to earth from the moon’s orbit on Christmas Eve, the result exceeded all expectations. This was the first time this view had ever been seen. The view is now known as Earthrise. Intriguingly, if you stand on the moon, you cannot see the Earth moving. You can only see it from a spaceship in orbit. Seen from the surface of the moon, the Earth is always in the same position in the sky, although its phases change. This is called tidal locking, and it is why we are able to point out the ‘Man in the Moon’ – because the moon always shows us the same face. But back to the picture. Yes, the Earth was truly beautiful. This blue and white pearl was indeed our home, but what it was floating in was far more significant. It was the blackness of space. There was our home, floating in nothingness, and it’s the only home we’ve got. Our home was that blue and white pearl. Compared to Earth, the astronauts dismissed the moon as a dull, plaster of Paris landscape. This picture brought it home to people that we have to look after our planet. Polluting it and migrating to another planet wasn’t and isn’t an option – then as now. On Christmas Eve, 1968, environmental movements stepped up a gear, and indeed, many date their origins to that time. The Earthrise photo showed the Earth as one: one planet, one environment, one country, one people. Many of us started our journey to the Bahá’í Faith at that point. So much so, that in 1976 John Huddlestone chose a similar picture for the front cover of his book about the Bahá’í Faith The Earth is but one Country. I’d like to finish with the words spoken by Anders, Lovell and Borman as they orbited the moon on board Apollo 8. Each of them read a verse in turn. No, I have not made it my New Year’s resolution to do more blogging. But I became aware, when commenting on another blog today, that whenever I do so there is a link back to mine. And I realise that my blog is really not something I want to invite people to visit these days. It is two years since I posted anything new on here. I went back through my draft posts and found a number that had not been completed or made live. They are not particularly good, and no doubt I thought I would write more, or at least clean them up a bit. Well, they may as well be available for others to read, so I have now posted these. Perhaps this brief note has helped me to ‘break the ice’ and get blogging again! A few days ago, Wordpress reminded me that I started my first blog – this one – nine years ago. The thinking that prompted me to write a blog was to explore things that were going on in my life at that time, and to make my experiences and analysis of those things available to others who might find them interesting. I have been a very dilatory blogger, and it is not surprising that I have few readers, even fewer followers, and only one who regularly comments (thanks, Thelma!). I keep a journal, and all too often I find that the things I want to write are too personal for me to wish to broadcast them. And so they go into my journal, rather than the blog. In my first blog post, I wrote that I wanted to explore the latency of the ’empty page’ that this new phase in my life, retirement, offered to me. Many of my subsequent posts charted the things I have got up to during the past nine years: activities that might not have been available to me while I was still doing paid work and raising a family. I promised that I would try to look forward, rather than back. Perhaps the fact that I have not kept this blog going is testimony to the fact that I am achieving this. But it is important to ‘be’ as well as to ‘do’ – and to reflect from time to time. It’s the first of May – “giorno della glorificazione del lavoro”, as the Socialist mayor of Brissago announced at a very sedate gathering round the war memorial in that lakeside village, where Martin and I happened to be on 1 May 1978. The event is memorable, mainly because I can attach it accurately to a date. Our week’s holiday in Brissago is memorable too. Martin’s employer at the time was the Dechema research institute in Frankfurt. In common with many German companies, they owned a holiday apartment which was available for employees to book at a favourable rate. We duly travelled down to Switzerland by train for a week of sheer luxury, in contrast to our usual humble lodgings in the city. For a week, we swapped a bedsit with no hot water, one-ring cooker and shared toilet for a two-bedroomed flat with fully-equipped bathroom and kitchen, and a balcony overlooking Lago Maggiore. Breakfast consisted of fresh rolls which one of us fetched from the local bakery each morning, with coffee and creamy Swiss yoghurt. We sat on the balcony to eat breakfast, looking East across the lake. On some mornings there was even sunshine – but mostly we experienced very rainy weather. Travelling across the St Gotthard pass on what still counts for one of my favourite train journeys, we noticed how spring, already arrived in the northern Alps, turned back to winter as we moved south. We would have expected the opposite. Notwithstanding the weather, we went out walking and exploring every day. An iconic rail journey on the Centovalli railway took us to Domodossola on the Italian side of the border. My memory of that town is that it was singularly unimpressive – but then, it was midday and the streets were empty. My other memory of Domodossola is of the most delicious ice cream I had tasted up to that point in my young life. We walked one day over the border into Italy and had lunch in the Italian lake-side town of Cannobio. The walking in the hills above the lake was not always easy: dense sweet chestnut forests and an absence of the well-made paths and clear signage for which Switzerland is known. It was rural, indeed rustic. We were young, and our experience raw and exciting. Twenty-seven years later, we were living and working in Zurich, and sometimes travelled down to Ticino (the Italian-speaking canton) for a day or a weekend. 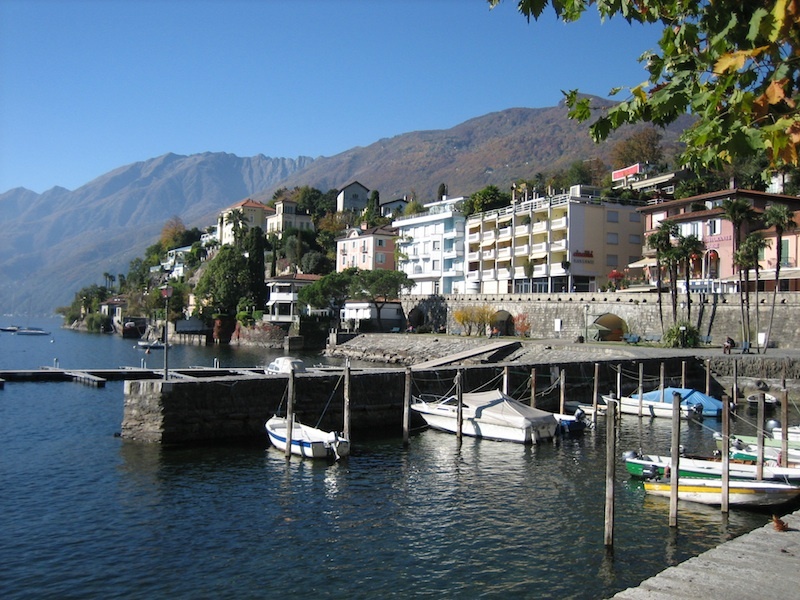 Arriving in Locarno, we would take a bus or boat to our favourite lakeside town, Ascona, where we would sit on the waterfront and watch the activity on the lake on a summer’s evening. One such weekend, we stayed on the boat and alighted in Brissago, further down the lake. Intrigued as to whether we could still find the apartment where we had stayed that week in 1978, we strolled the narrow streets of the village until we were pretty sure we’d found it. By the front door to the apartment, a family was packing their luggage into a car with a Frankfurt registration. We interrupted them to ask whether the apartment was still owned by Dechema. Yes, it was: they worked there, and told us the latest news. My memory of our first visit to Brissago is clearer and more detailed than the memory of our second visit there ten years ago. What I recall from 1978 are the sights, sounds, even smells of the place, and the way I fitted these into my developing understanding of the world. What I recall from 2005 are the sensations: the warmth of summer, the tingling feeling of rediscovered youth, the joy of reaching out over the years and imagining my 21-year-old self running up the hill to the bakery and practising my (then as now) rather inadequate Italian. My father-in-law, W B Lockwood, passed away on this day three years ago. I have many memories of him in the thirty-eight years I was privileged to know him. I have recently observed that many of us, as the years proceed, look back and recall events from our earlier years. Some older people seem to ‘live in the past’. Bill was not one of these. Throughout his long life, he was interested in the world around him, taking an interest in new people and, especially, new words. But in his later years, he did occasionally reflect on the past. He was always a good raconteur, and had a great store of anecdotes from his varied experience. His stories tended to shed light on a particular situation or character; he was a modest man and did not use his story-telling for the purpose of self-aggrandisement. Bill recognised the power of the internet, though he felt too old – his own words – to learn how to use it himself. He realised that it was possible to search for information about a person, especially one who had ‘made his mark’, and was gratified that there were several websites containing references to his own work, especially in the field of Faroese. From time to time, he would ask us to look up a person he had been at school with. Several of his school friends had had successful careers in education or the diplomatic service. Sadly, but inevitably, the most recent reference we found was often the person’s obituary. One of Bill’s favourite stories, when recollecting his schooldays. was of a certain incident in the English Literature class. The teacher would ask a boy to read aloud a passage from the text the class was studying. One boy, Rodgers, read with great gusto and dramatic emphasis. On one such occasion, the text was Shakespeare’s Macbeth, and Rodgers declaimed “Duncan is dead and in his grave”. As he did so, he looked pointedly in the direction of another teenager in the class, whose name was Duncan. The class erupted in laughter. The last time I remember Bill retelling this story, aged 94, he added calmly “I expect Duncan really is dead and in his grave”. Postscript: One thing that kept Bill’s focus firmly in the present was his great interest in the work of his protégés in the field of language studies. He followed them closely, and two of them, now working in Germany, regularly sent him copies of their publications and kept him informed on the progress of their research. Four of his former students wrote a very touching tribute to him two years ago. It’s so nice to be back in my own bed. To come home, even after just three days away. My in-laws’ place is, in a way, a second home. We have spent a lot of time there over the past 40 years, and especially the past three years. But all the same, our time there is a bit like camping. The place, now without any permanent resident, is neglected and shabby; the furniture and equipment mostly worn out, uncomfortable and impractical. The same could be said of some of the things in our own house. But it is our shabby furniture, our tired decor. And the things that matter are here: a comfortable bed, hot running water. Home is important to both of us. To my husband, his parents’ house feels like home. Especially the garden. To me, the house where we raised our family and where we have lived for most of our adult lives is ‘home’. My heart lifts as we approach our village, and I get a thrill when I open the front door. I wish I could say that home is wherever I find myself in the company of people I love, and where I feel loved. But, to me, it is definitely a fixed place. For Climate Week, three Gloucestershire organisations are working together to organise a ‘climate cake’ competition. The competition will be judged at 2pm today, Saturday 9 March at Global Footsteps café in Cheltenham, by representatives from Global Footsteps, Transition Town Cheltenham and Friends of the Earth Cheltenham. I decided to submit a cake in one of the three categories: least travelled cake, most fair trade cake, and best decoration depicting climate change. The first two categories require you to think carefully about where ingredients come from. I felt that the ‘least travelled’ category would be the most challenging. I was up for the challenge – and such it was. Over the next few posts, I’m going to take a long hard look at each ingredient and how I sourced it. The process has involved thinking about what alternatives I might use, if a locally sourced product just isn’t available – should I use hazelnuts, grown in the UK, in place of almonds, grown in mediterranean climates? — as well as the route from the producer to my kitchen. I’ve researched various products and found a few surprises on the way. At the end, I will give the recipe for this cake. In the late seventies there was a TV series entitled ‘Connections’, presented by science historian James Burke. The programmes examined the connections between technological developments through the ages. For instance: did you know that modern teleommunications owe their existence to the use of stirrups by the Normans? As an enthusiastic young student with a thirst to know and understand the world, these theories thrilled me. If only the course of history were so easy to explain! These days, I get my intellectual thrills in more prosaic ways. A link or relationship between something I read yesterday and a name dropped in conversation today is enough to make me feel connected to the world in my own right. Let me give an example. The book group I belong to selected Nicholas Shakespeare’s Secrets of the Sea as its latest choice. I battled my way through this novel, which I did not rate very highly. Perhaps it was just that I wasn’t reading it at ‘the right time’. And also, having had to join Worcestershire county libraries because Gloucestershire apparently didn’t have a copy, I was willing the book to be better than it was! I skim-read the last few chapters, but with a pang of conscience, thought I ought to read up on the author. Maybe he has written something else that I would like to read. And indeed, Shakespeare has written a travel book about Tasmania. His descriptions of the island, its landscape and people were about the only thing I did like in the novel. So maybe travel writing is his better genre. He has also written, or co-written, a biography of Bruce Chatwin. Aha – now it gets interesting. I loved Chatwin’s writing, which I encountered through his travel books which I read in the early nineties and subsequently moved on to devour his novels. Cue some online research into Chatwin’s biography … where I learn that his brother Hugh lived in Worcester. And so to research Hugh Chatwin. As so often happens when you Google the name of someone not particularly famous in their own right, the results may include the occasional reference to that person but are most often headed up by links to obituaries (assuming the person is dead, of course). A tribute to Hugh Chatwin appears on a blog that I started following a year or two ago, written by a local environmental activist, peace campaigner and general ‘good egg’ Martin David. Martin was one of the first people I met when we moved to Cheltenham in 1980, manning the Pax Christi stall at an International Peace Day event (at which the speakers were, among others, Diane Abbott, Hugh Montefiore and Frank (now Lord) Judd.